All of Kitchen Parade's recipes, organized by their primary ingredients. If you have a particular common / special pantry ingredient on hand, start here for ideas on how to use (or use up and not waste!) it. I spend a lot of time thinking and writing about How to Save Money on Groceries. It's just embedded in my culinary DNA. It's who I am. And like many frugal cooks, I've learned three proven ways to save money on groceries week in and week out. Don't waste food, use up what's on hand. Before making a grocery list, "shop" from your pantry, fridge and freezer. Stock up on the most-used ingredients when prices are good. All three tricks require an easy way to take advantage of specific ingredients. 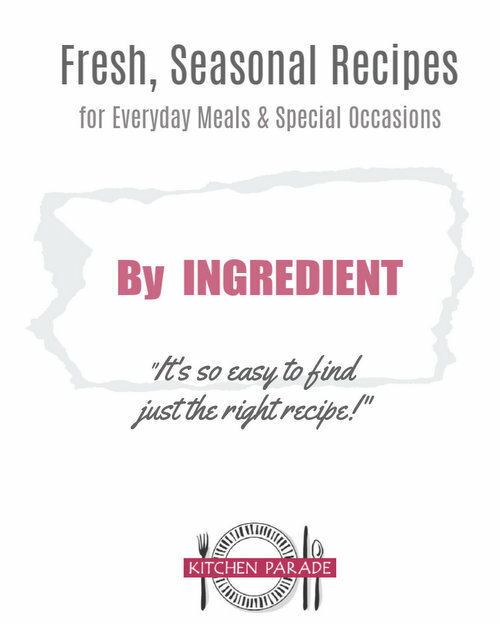 This page is especially designed to help home cooks easily find much-tested, trusted recipes for common cooking ingredients, including ingredients commonly accepted as super foods, especially those with short shelf lives most at risk of going to waste. Agave is the 'sweetener du jour', professed to be 'sweeter' than honey (so you can use less), to have a lower glycemic index (so preferred by diabetics, carb watchers and others who wish to control their glucose intake) and plant-based (so vegan) and less processed (compared to granulated sugar, say). On the downside, it is more expensive than honey and for most of us, travels many miles to reach our cupboards. The best price seems to be a Trader Joe's though you won't find it next to the honey, instead, next to the stevia, another natural sweetener. Use agave when honey is called for, usually using three-quarters of the amount of honey that's called for. In the fall, pick up a jug of apple cider, preferably unpasteurized from a farm stand somewhere. Over a few weeks, it will change in character, ripening, developing a real "zing". Good stuff! Arugula is also called "rocket" and is a tender slightly bitter, lively and peppery green, lovely for salads. The later in the season, the more bitter it can become. It doesn't keep well so in the States, is rarely found in grocery stores and can be pricey at farmers markets. THIN OR FAT? Thin tapers of asparagus are much ballyhooed but the fat spears are my favorite, especially for roasting. CLEAN WELL Rinse fresh asparagus well, especially the tips which can collect grit. HOW TO SNAP OFF THE WOODY ENDS Most recipes call for 'snapping off the woody ends' -- this means to bend the spear near its base, it will find its natural breaking point. It's got a natural rhythm: Bend, Bend, Snap. Bend, Bend Snap. It's shown in a short video here, Asparagus & Woody Ends (Step-by-Step Photos & Video) Save the ends for asparagus soup! PEEL OR NOT TO PEEL? I've learned to check the skins, if they're fibrous, it pays to skim them off with a vegetable peeler before cooking. Calico Beans aka "Alanna's Famous Cowboy Beans"
VERY VERY RIPE BANANAS For baking, bananas add luscious banana flavor only if they are very, very, very ripe. How ripe? See these photos of ripe bananas, including my favorite "black bananas". NO RIPE BANANAS? Try sautéeing banana chunks in butter, see Banana Nut Cake with Caramel Frosting for details. Stock up on bell peppers in the early fall when they're especiallly plentiful and inexpensive, especially at the farmers market. Mostly, we use fresh peppers but a few recipes also call for Roasted Peppers. Fresh blackberries and fresh raspberries are often interchangeable, though blackberries often have more seeds and need more sweetener. I often buy them frozen at Trader Joe's. These recipes use bread that's already been baked, especially stale bread that might otherwise go to waste. If you'd like to make homemade bread, check the homemade bread recipes. I love to make bread! Broccoli rabe [pronounced "rob", also spelled "broccoli raab"] is also called "rapini" and is a slightly bitter but wonderful green. HOW MANY BRUSSELS SPROUTS IN A POUND? There are about 50 tiny sprouts in a pound, only 17 - 20 large ones in a pound. WHY DO SOME PEOPLE NOT LIKE BRUSSELS SPROUTS? It's not a matter of taste, but a matter of chemicals called glucosinolates. If someone in your family is hesitant, resistant or outright militantly in opposition to Brussels sprouts, the trick is to break up the center of the sprouts by cutting them in half through the core and then, to leach out the chemicals, to cook in a lot of well-salted water. WHAT IS BULGUR WHEAT? Bulgur wheat is highly nutritious because it’s made from the whole kernel of wheat, with just a touch of the bran removed, then parboiled and dried, so that when it reaches our kitchens, it cooks quickly. It even “cooks” just by soaking it for an hour in boiling water. Also called / spelled BULGHUR and BURGHUL and BULGAR WHEAT. Salted vs Unsalted Butter Kitchen Parade recipes usually call for unsalted butter, which lets us, the cooks, control how much salt to add, especially important for baked goods. That said, in recent years, I've begun to use salted butter again with great results, especially for older recipes, when salted butter was all that was available. My favorite butter All Kitchen Parade recipes are tested with my favorite butter, Land O' Lakes, both salted and unsalted, which has 80% butterfat. I rarely use European-style butters, which typically have a higher butter-fat content (usually 82%) and are more expensive. For baking, I never use butter from Sam's Club, say, which has a lower butter-fat content. How to soften butter Place a wrapped stick (not a whole box) on a plate and leave it at room temperature for 30 - 45 minutes. If you cut it into chunks and separate them, the butter will soften in about 15 minutes. To test if the butter is soft enough -- but not too soft -- for baking, press the tip of your finger into the butter. If you're slightly obsessive about this stuff, the proper temperature for creaming butter is 65F - 67F. How to to soften or melt butter in the microwave Cut a stick into pieces and place in a small microwave-safe dish. Mike for five seconds at a time, until the butter is softened or melted. This technique is not recommended for softening butter to room temperature unless the recipe specifies. Butter equivalents A stick of butter weighs 1/4 pound and is equivalent to a half cup (eight tablespoons) of butter. Four sticks of butter is a pound of butter. Can butter be frozen? When butter is on sale, stock up! It can be frozen, making a batch of cookies just a few minutes away. Butter freezes beautifully! Anyone having trouble with butter may find this 2008 article useful, Butter Holds the Secret to Cookies That Sing. Why do recipes call for buttermilk? Buttermilk is must-have ingredient for baking. It's slightly acidic, so helps break down the gluten from flour. This makes pancakes fluffier, muffins more tender and cakes slightly 'tangy'. For a dieter, buttermilk does all this with just a few calories! For a frugal cook, it does all this for low cost. For a thrifty cook, it does all this and lasts for weeks. Good stuff, buttermilk! American buttermilk vs other buttermilks The buttermilk product found in the U.S. is a 'cultured' buttermilk, akin to yogurt. Cooks from other countries have access to old-fashioned, churned buttermilk, a thin, slightly acidic liquid left over after churning butter from full-cream milk. The two are not interchangeable. Cultured buttermilk Until 2012, Kitchen Parade recipes were tested with cultured buttermilk. An okay substitute for commercial cultured buttermilk is "soured milk" – just place a tablespoon of lemon juice or vinegar in a measuring cup, then add milk to measure one cup in total. But really, make your own buttermilk In 2012, I started to make Homemade Buttermilk. Wow, this stuff is good, I keep a bottle on hand nearly all the time for baking, for salad dressings, for terrific smoothies. What are capers? [KAY-pers] Capers are one of my very favorite pantry items because they add a touch of piquancy and a bite of saltniness to so many dishes. Capers are actually the flower buds of bushes found in the Mediterranean and Asia. The buds are sun-dried and pickled in a salty brine. Some capers are tiny, others are as large as a small grape. Many recipes suggest rinsing capers before using, I don't find this necessary. BABY CARROTS vs WHOLE CARROTS For eating out of the hand, so-called "baby" carrots are great. But for cooking, "baby" carrots have no flavor and in fact, are not even baby carrots. (They are huge industrial-size carrots shaped into small carrot bullets.) If you can manage the two or three minutes it takes to peel whole carrots, it's worth it. In fact, unless the skins are tough, I often skip peeling carrots entirely. Celeriac is pronounced [seh-LER-ay-ak] and is also called 'celery knob' and 'celery root'. It has a rough, brown exterior and is quite ugly on the outside but has a pearly white dense flesh inside. While it is not easily found in American supermarkets, I find it in farmers markets during the late summer and early fall. Here's a photo of celeriac. Celery appears in one Kitchen Parade recipe after another, too common and too many to make a list useful, really. It is one of three vegetables in the "holy trinity" of onion, celery and bell peppers. It's a staple in salads, adding volume and crunch and wetness. But it is quite rare for celery to "star" in a dish but I have come to appreciate these special celery dishes, especially the celery salads during the winter. Do look for celery stalks that have their leaves, they are fabulous. To keep celery fresh longer, keep it in the plastic bag but wrap the bag in foil. It will stay fresh for a month or more. During long car trips, I cut up celery sticks to munch on. Feta cheese is a particular favorite since it's strong-flavored but has fewer calories than other cheeses. Do try to purchase it in bricks, not crumbles, it's fresher and still more flavorful. Be sure to save bits of Parmesan rind, too. Just toss them into a pot of soup to add richness and flavor. Small four-ounce cans of green chiles are wonderful! I usually buy "mild" green chiles, they add a fresh, warm fresh green-chile flavor to dishes. Spicy-food lovers? Power up to the "hot" green chiles! Green chiles are a key flavor profile in the distinctive cuisine of New Mexico, usually from New Mexico's Hatch chiles. Hatch chiles are very seasonal at best and hard to find at worst, my solution is these tiny cans of green chiles. Yes, I am smitten with green chiles! See also Salsa Verde. Chipotle [pronounced chee-POTE-lay] chiles are really just the familiar jalapeño chile, dried and smoked. Find them in small cans in a Mexican market for maybe $1.50. Inside are 10 or 15 small peppers, each one packing some powerful heat, in an adobo [pronounced uh-DOH-BO] sauce made from ground chiles, herbs and vinegar. For a southwestern or Mexican dimension to stews or salads, remove the seeds of one pepper, mash it and use about half. The contents, if transferred to a glass jar, will last for months in the fridge. Some times recipes call for the peppers themselves, some times just a smidgen of the adobo sauce, so it's good to keep the two things separate. But in recent years, I've taken to running the entire can through a mini food processor to make a chipotle chile adobo paste. This is good stuff, inexpensive, refrigerator-stable, with huge flavor. And heat too, use just a tiny bit at a time! Cocoa powder is one of my favorite pantry ingredients because unlike chocolate chips and chocolate bars, there's no snacking on it during a hungry moment! When cocoa powder is called for in Kitchen Parade recipes, it is always the naturally unsweetened cocoa powder, never the sweet or Splenda-sweetened cocoa used for a commercial hot chocolate mix. I'm especially fond of the Hersheys Special Dark which is a "Dutch processed" cocoa powder with deep color and an intense chocolate flavor. To make Dutch-processed cocoa – Mix 3 tablespoons natural cocoa powder with 1/8 teaspoon baking soda. To make natural unsweetened cocoa – Mix 3 tablespoons Dutch processed cocoa with 1/8 teaspoon cream of tartar or vinegar. To keep cilantro fresh, rinse it well, then stick the whole bunch, stems down, into a cup with about an inch of water and store in the refrigerator; if needed, freshen the water every couple of days. Coffee For years, I made special trips to buy coffee beans, then every morning took the time to faithfully grind the beans to make the "best" coffee. Then I read somewhere – probably Cook's Illustrated – about the rich coffee made from Folgers, yes, Folgers, 100% Colombian. Ever since, it's my coffee of choice, a big tub can be found for $8 or $9. It's become harder to find in the last couple of years but it worth seeking out. Espresso Do you say "expresso"? I did too for a long while, then learned that the proper spelling and pronunciation is "espresso". So pretty! I don't have an espresso maker but have great luck with instant espresso powder from Medaglia D'Oro. Tea Red Rose all the way, baby! This is the traditional Canadian tea and in honor of my Canadian mother, this is the only tea my family drinks. Red Rose was acquired by Lipton a few years ago and so now Red Rose can be found in the States. Unfortunately it is not the "real" Red Rose which can only be found in Canada. Commercial producers of these products, especially the "quick" or "instant" versions, blur the differences. To experience what's special with each one, purchase them directly from the mills, I've had great luck with Anson Mills, War Eagle Mill (which I've personally visited!) and also with the Bob's Red Mill products available in good grocery stores. All whole-corn stone-ground products should be kept in the freezer so that they don't go rancid. If you really love corn bread, you'll not want to miss the cookbook called The Cornbread Gospels. But naturally, I keep a collection of my own favorite cornbread recipes! CORNMEAL is field corn that's been dried and ground and thus qualifies as a 'vegetable' especially if the more healthful full-kernel stone-ground cornmeal is used, either in a coarse or a fine grind. That said, some recipes really need the finer texture of a degerminated yellow cornmeal so I keep both on hand. GRITS are a southern specialty and are usually the most coarsely ground. POLENTA is an Italian dish that's made from boiled cornmeal. Polenta is usually the most finely ground cornmeal. Pronounced [koos-koos], couscous is made from semolina flour (a wheat flour) which makes it a culinary cousin to other semolina-based products such as macaroni, spaghetti and other pastas. For pasta, semolina is mixed with egg and water. For couscous, semolina is mixed with just enough water to form tiny grain-shaped bits. Couscous is not a grain, although often treated like one. "Israeli Couscous" is shaped into tiny perfect pearls with a pasta-like texture. Yes, I have a "thing" for fresh cranberries! I just love their brilliant color, their sour burst of juice. Better yet, for calorie watchers? Fresh cranberries are the better choice. Fresh cranberries are big, because they haven't been dried, so especially when they're chopped, they go further, more berry for the buck, so to speak. And fresh cranberries are unsweetened; did you know that dried cranberries aka "craisins" are nearly always heavily sweetened? WHAT KIND OF CREAM CHEESE SHOULD I BUY? Three kinds of cream cheese are easily found. The best-known is full-fat cream cheese, 100 calories per ounce (Weight Watchers 2 points). My favorite – there's no telling the difference – is the reduced-fat cream cheese often called 'Neufchatel', 70 calories per ounce (Weight Watchers 1 point). Avoid using non-fat cream cheese, despite its 30 calories per ounce (Weight Watchers 0 points), as it is gummy and watery. Dried beans are inexpensive but require time and a little know-how to soak and then cook. Canned beans are relatively expensive (compared to dried beans) and convenient albeit, even to my salt-loving taste, oh-so-salty. (Do know, you can wash awash much of the salt in canned beans by rinsing them before using them.) For different reasons, both are staples in my kitchen. Different kinds of beans and peas have different textures, that's why I go to considerable effort to specify which of my recipes call for specific beans. For example, kidney beans are quite fibrous and hold up well in chilis and long-cooking soups. In contrast, white beans can be quite creamy and so are the usual choice when making appetizers and spreads. And of course, chickpeas are the favorite choice for that kitchen staple we call hummus. In fact, do you know that the word "hummus" means "chickpea"? How to Cook Dried Chickpeas Especially for Hummus aka "Jerusalem Chickpeas"
None so far, this is my reminder! Dried currants and raisins are interchangeable. That said, I prefer currants because they are smaller (and thus a smaller quantity distributes more easily) and slightly less sweet. 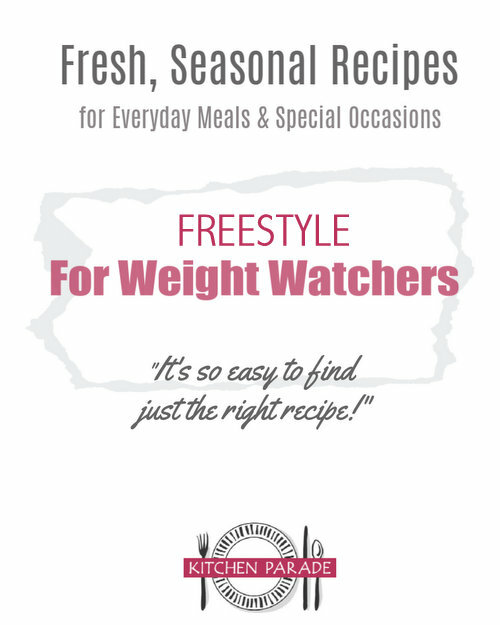 Dried fruit are "dense" calories, the calories and Weight Watchers points can really add up, see One-Point Fruit Servings for Weight Watchers. Ever wonder about the nutritional impact of evaporated milk? Me too. See this soup recipe for some insight, Cream of Broccoli & Carrot Soup. I also compare the nutrition for both full-fat and non-fat evaporated milk, whole milk and half & half. Very interesting! WHAT IS FARRO? Farro is a natural grain that once cooked, is nutty in flavor and slightly chewy in texture. It is also called "emmer wheat" and is much-appreciated in Italian cuisine. I use the "pearled" or "semi-pearled" farro where some of the husk is removed so it cooks more quickly. Farro can be hard to find in a store but can be purchased on Amazon. FLUFF TO AERATE BEFORE MEASURING This is my favorite baking trick! Always fluff flour before measuring it. You see, when flour sits, it settles. As you stir the flour for just a few seconds, you'll add air and actually feel it lighten. By fluffing the flour first, you'll use as much as 25% less flour, by weight. The result is that all your baked goods will turn out noticeably lighter -- pancakes, muffins, cakes and cookies. I keep a spoon right in the flour canister, so I never forget and rarely, rarely get out the flour sifter, which performs much the same function. It's a miracle tip! Try it yourself, then pass it on to a friend! OUR FLOUR CHOICES MATTER Time was, flour was flour. (Or maybe not, but at least in my experience growing up, there were two kinds of flour, "all purpose" and "bread".) As I make the switch from bleached flour to unbleached flour, my baked goods just don't taste the same, they're drier and tougher and the baker, well, she's plenty frustrated. I haven't yet figured out how to make the transition more easily. So I'm beginning to record what flours I'm using and for best results, will recommend use of the same flour. Kitchen Parade recipes use several kinds of flour. All-Purpose Flour (Bleached) – Often called "white flour" or just plain "flour", all-purpose flour is a low-gluten wheat flour and often the only flour found in home pantries. However, all-purpose flour is milled without the germ and the bran, so has less fiber and fewer nutrients than whole-grain flours. In the U.S., all-purpose flour is enriched with vitamins and minerals by law. To incorporate more whole grains into our diets, many home cooks now substitute as much as half whole-wheat flour for all-purpose flour. My favorite all-purpose flour is Pillsbury but I use others, as well, especially if on sale. Whole Wheat Flour – Is a heavy, high-gluten and full-flavored flour. Typically, about 1/4 to 1/2 of all-purpose flour can be substituted with whole wheat flour. I buy ground-yesterday whole wheat flour at Great Harvest Bakery and store it in the freezer to keep it fresh. I also buy King Arthur and Trader Joe's Whole Wheat Flour. 100% White Whole Wheat Flour – Is a relatively new product, a whole-grain flour milled with the idea that it can be substituted 1:1 for all-purpose flour. However, my own experience is that this flour (the King Arthur brand, anyway, which is found in many supermarkets) cannot be substituted 1:1. Bread Flour – Is unbleached and especially milled for high-gluten content and is primarily used for yeast breads, especially rustic breads where some heft is desirable. Cake Flour – Has a silky texture and is often specified for fine-crumbs cakes and baked goods. Arrowroot Flour – A fine powder made from the stalks of the arrowroot plant, arrowroot is used as a tasteless and easily digestible thickening agent. Diabetics often use arrowroot instead of flour or cornstarch to thicken stews and soups. It should be mixed in very late in the cooking process, as heat tends to break down its thickening capabilities. In small jars in the spice section, arrowroot is very pricey; instead, find it in large bags at Whole Foods in the flour aisle. FRESH GARLIC vs JARS For everyday cooking, I use jars of chopped garlic purchased inexpensively from a small Asian market, worth their weight in gold. Here's a photo of the brand of chopped garlic I use. GARLIC PRESS For fresh garlic, I often use a garlic press. Goat cheese has a lovely piquancy. It can be expensive so for every day, I use big logs of less-expensive goat cheese from Sam's Club or Trader Joe's -- or for a quick substitute, use cream cheese. Good news: goat cheese can be frozen, it need never go to waste. I love to keep graham cracker crumbs on hand, one of the very few convenience foods that I rely on. Why? The obvious: with graham cracker crumbs, you've got a quick pie crust in 5 minutes. The less obvious reason? If a box of graham crackers were on hand, it would tempt and tantalize me. Some night, I'd have a snack attack and eat a whole package. A box of crumbs? It's just a box of crumbs. Lately, Trader Joe's Old-Fashioned Cinnamon Grahams have become my graham-cracker of choice for a thick, sturdy graham cracker crust. Here's that recipe, My Favorite Graham Cracker Crust! The trick, I've learned, to cooking green beans is to make sure they'e cooked in a lot of water with plenty of salt. Per pound of green beans, use two quarts of water and one tablespoon of table salt. It makes a world of difference! Watch for flat 'Romano beans' at the farmers market – they're especially tender and delicious! First introduced by native Americans to early American settlers, hominy [HOM-eh-nee] is popcorn-shaped kernels of dried corn, with the hull and the germ removed. It is dense, chewy and nutty. Look for it in the Mexican section of grocery stores in cans like black beans or pinto beans. While I will always encourage home cooks to Never Buy Salad Dressing Again, at the same time, a bottle of Italian salad dressing can be helpful to have around. I nearly always use the non-fat house brand, it works like a charm. These knobby creatures are also called 'sunchokes'. See a photo here. Believe it or not, ketchup is a quick and inexpensive way to add instant flavor to a dish. Check the label, however, for many favorite ketchups include high-fructose corn syrup. [kohl-RAH-bee] Kohlrabi is in the turnip family and like the turnip, its white bulblike stem and its greens are edible. The kohlrabi bulb tastes like a mild, sweet turnip or broccoli stalks. It's wonderful raw! NUTRITION INFORMATION for Kohlrabi, per 1/4 pound raw kohlrabi: 30 Calories; 0 g Tot Fat; 0 g Sat Fat; 7 g Carb; 4 g Fiber; NetCarb3; 3 g Sugar; 23 mg Sodium; 0 mg Cholesterol. WEIGHT WATCHERS POINTS WW Old Points 0 & PointsPlus 1 but "free"
Leafy greens (those are the greens like kale, mustard greens, beet greens, spinach, collard greens, turnips greens along with the leafy lettuces such as red leaf lettuce, green leaf lettuce) are some of the most healthful foods and most of us, me included, don't eat enough of them. Leafy greens should be washed well before cooking or eating. Rinse the leaves under running water, wiping the leaves with your fingers; or let the greens soak for a few minutes in cool water, then 'swoosh' around and rinse thoroughly. To know if the greens are free of grit, eat a leaf! WHAT IS KAMUT? Kamut (pronounce kuh-MOOT) is a high-protein wheat that’s nutty in flavor and chewy in texture. My pantry is rarely without at least one of two kinds of lentils. Both are prized for hearty flavor and for holding their shape after cooking, especially compared to brown lentils or red lentils. They do take slightly longer to cook. Black Beluga Lentils (some times just Black Lentils) – These were once available at Trader Joe's in dried form very inexpensively. I'm told that the dried lentils will return to the shelves but in the mean time, Trader Joe's does sell bags of pre-cooked black lentils although for a much higher price. They're also available here on Amazon.com. "Green Lentils" or "French Lentils" (Lentilles du Puy) – I find these pretty lentils at Whole Foods and in bulk bins at other grocery stores. They're also for sale on Amazon.com. Brown Lentils – These are much less expensive and more easily found than Black or Green Lentils. I once pooh-poohed them but then realized the flavor and texture are much the same, only the color varies. Red Lentils – Red lentils look so pretty in the package but cook down to a pale and lentil-y mush that can really work in a recipe so long as you know what to expect! 'Grade B' maple syrup isn't second-quality maple syrup, in fact, it has the most flavor. It's the maple syrup I always seek out. I am a Hellman's gal, Hellman's Light Mayonnaise, that is. To my taste, the Light Mayonnaise tastes just as good, if not better, than the full-fat mayonnaise — all for half the fat and half the calories. For salads, I often thin the mayonnaise with buttermilk for a still lighter and tangier texture and taste. Hellman's goes by the name Best Foods west of the Rocky Mountains. For a vegan mayonnaise, I make Almonnaise that's based on whole almonds. For BLTs, I make Homemade Mayonnaise. The thick skin of a melon, especially the rough skin of a cantaloupe, can harbor bacteria and other unsavory stuff. Please - do wash the exterior of a melon before cutting into it, so that the knife doesn't transfer it from the skin to the flesh. At least in the United States, which naturally I know best, MILK comes in several ways , skim milk having the least fat, cream having the most. I drink skim milk every day but keep both whole milk and cream on hand nearly all the time for coffee and cooking. TASTE MILK! It pays to try milks from different producers. I love the milk from Farmers' Creamery so much, even the skim milk, that some times I drink it from a wine glass! I credit the grass-fed cows. SKIM MILK is some times called non-fat milk but still has some fat, a scant half gram per cup. 1% MILK is considered low-fat milk. 2% MILK is considered reduced-fat milk. WHOLE MILK has 3.25% fat, enough fat that it can thicken custard. HALF & HALF is half whole milk and half cream, thus, yes, half and half! In the U.S., half 'n' half is easily available in the dairy case but of course, you can mix your own, just mix half milk and half cream. NON-FAT HALF is a Land O' Lakes product, with 'taste' of half & half without the calories. I love this for my morning coffee and for stirring into a milk-based soup, say. But I've learned the hard way that it has no thickening properties so can't be used for custard or ice cream, say. CREAM is heavy cream, the cream used for making homemade whipping cream. EVAPORATED MILK aka "CANNED MILK" is high in protein. For nutrition detail, see Cream of Broccoli & Carrot Soup. SWEETENED CONDENSED MILK is thick, viscous, like milky caramel. It's the "key" (tee hee) ingredient in Key Lime Pie. I love the distinctive flavor of molasses, dusky and dark, sweet and sour at the same time. "Light 'molasses" comes from the first boiling of the syrup from sugar cane and sugar beets. "Dark molasses" comes from the second boiling and is thicker, darker and less sweet, which is why, perhaps it's my personal preference. I'm also a fan of "blackstrap" molasses from the third boiling even though many find blackstrap molasses too bitter. Watch too for "unsulphured molasses" which has a purer, more refined sugar-cane flavor but can be harder to find. MUSHROOM TIPS Can mushrooms be washed? 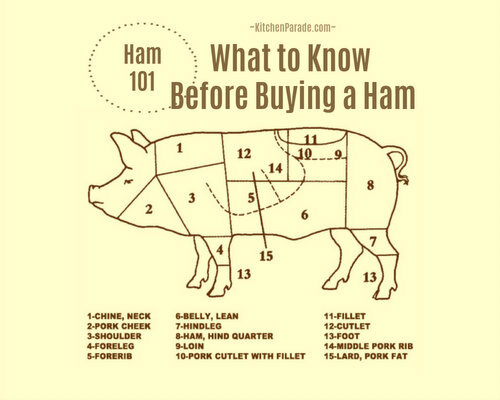 Yes, especially if they're going to be cooked, but do trim off the rough edges first. For raw mushrooms for salads, say, brush off the dirt with a small brush. Cut mushrooms in large pieces (or leave whole or separate the caps and then slice the stems) to avoid a 'canned mushroom soup' character. There's one trick for stuffed mushrooms, cook them first. WHAT IS 'GOOD' MUSTARD? Kitchen Parade recipes often are no more specific than 'good mustard' -- which is to say, anything except yellow 'ballpark' mustard. The safe bet is Dijon mustard, a pantry staple. But feel free to explore the many, many mustards available now, especially the mustards from other countries, some times sold in tubes like toothpaste! Many mustard packages bear a date -- purchase the freshest mustard possible, it loses strength sitting on the shelf. My refrigerator is rarely without a jar of Homemade Finnish Mustard, it keeps for weeks. How to store nuts Nuts can be more expensive than meat, we don't want them to go to waste! To keep nuts fresh, store them in the freezer, just 'double-bag' to avoid freezer burn. For baking, heighten the natural nut flavor by toasting the nuts beforehand. How to toast nuts Arrange the nuts on a baking sheet, use a single layer with plenty of space between the nuts. Roast in the oven at 350F or 375F until the nuts begin to turn gold in color, stirring every 5 minutes, watching very carefully at the end. I often start toasting nuts while the oven is preheating, it works great. Nut substitutes Nuts are often interchangeable so don't hesitate to substitute one for another. Old pecan trees still grow wild along the riverbanks in Missouri. The smaller, sweeter pecans are painstakingly harvested by hand. Read more here in the recipe for Buttered Pecan Ice Cream. BLACK WALNUTS If you can find them, black walnuts have a distinctive flavor that many people, including me, find quite addictive. Believe it or not, I buy large bags of black walnuts (Missouri native walnuts, no less) at Sam's Club in St. Louis. Keep them in the freezer for lasting freshness. TOASTING To my taste, English walnuts should nearly always be toasted before baking where black walnuts need not be toasted. WHICH OATMEAL IS BEST? Kitchen Parade recipes call for the least-processed forms of oats, either steel-cut oats or what the Quaker people call "old-fashioned" oats. So-called "quick oats" may be substituted with good results but "instant oats" or any of the sweetened breakfast oat packets should not be used. For a description of all the types of oats (old-fashioned oats, steel-cut oats, etc.) you'll want to read Oatmeal: How and Why to Cook It Every Day. Store green onions in the refrigerator, all others in a cool dark place. Onions can be purchased less expensively in three-pound bags and since onions last for several weeks, this can be a real bargain. Wash onions before slicing into them, preventing any dirt or contamination on the outside being transferred to the cutting board and to the interior of the onion. Discard or compost the root end and the leaf end, but otherwise throw the skins into a freezer bag and keep in the freezer to add to chicken stock, vegetable stock, etc. the next time a batch is made. GREEN ONIONS  Green onions are also called scallions. They're typically left raw but can be quite delicious when softly cooked in butter or olive oil, as in Asparagus with Green Onion Sauce or used to add flavor to a cooking liquid as in Asparagus Scallion Salad. YELLOW ONIONS  When a Kitchen Parade recipes calls for 'onion', choose a yellow-skinned yellow onion or a brown-skinned yellow onion. Yellow onions brown better so are an especially good choice when you want to caramelize onions. I've learned recently that the yellow-skinned onions are also called 'Spanish onions'. RED ONIONS  Red onions are especially pretty in salads, just be sure to chop them very small so not to overwhelm with onion flavor. WHITE ONIONS  White onions have a sharper, more onion-y flavor. Choose white onions when you'd like onion flavor to stand out. They also have less juice so are a good choice for anyone whose eyes water when cutting onions. Many Mexican recipes call for white onion. SWEET ONIONS such as Vidalia or Walla Walla  Choose sweet onions only for dishes where they'll stay raw, for sweet onions actually go flat when cooked. Unfortunately, some grocery stores label sweet onions as 'yellow onions' so be sure to watch the little stickers on the onions themselves. Interestingly, sweet onions start off from the same plant but the soil and the climate are so different, they end up tasting much different. Sweet onions have a shorter shelf life than yellow, red or white onions. SHALLOTS  Shallots have a gentle onion flavor, I especially like to use shallots when a recipe calls for just a tablespoon or so of onion. They keep a long time so are especially useful to keep on hand. LEEKS  Another way to encourage gentle onion flavor is with leeks. Frozen orange juice concentrate is my favorite way to create intense, undiluted orange flavor. I keep a small container in the freezer nearly all the time, scooping out a spoon or two as needed. WHAT IS PANKO? Panko (pronounced pawn-ko) is a Japanese bread crumb, light and coarse and crunchy and best of all, shelf stable. I used it for crumb toppings for both sweet and savory dishes. Check out an Asian market, panko is sold in bags or boxes. Increasingly, you can find panko at a regular grocery store but for 3x the price. If you can't find panko nearby, it's available on Amazon. For more flavor, choose flat-leaf parsley (also called Italian parsley) rather than curly parsley. But wait! That's the common wisdom, yes, to choose Italian parsley for flavor. But Mark Bittman (who wrote the Minimalist food column at the New York Times until 2011) says that freshness is more important than variety. To keep the parsley fresh, rinse it well, trim the stems by a quarter inch or so, then stick the whole bunch, stems down, into a water glass (one tall enough to brace the stems without smashing the leaves) with about an inch of water and store in the refrigerator; if needed, freshen the water every couple of days. Kitchen Parade recipes are tested with two types of pasta. For dried pasta, I prefer an Italian dried pasta such as De Cecco. I also often use the low-glycemic pasta from Dreamfields. It may be "low-carb pasta" but it's so good, no one will notice the difference. It comes in just a few of the most common pasta shapes and can be hard to find but is worth seeking out. Peaches and nectarines may be interchanged. Many Kitchen Parade recipes include a cup or so of peas at the end of a recipe. Bags of frozen peas are inexpensive to buy and easy to keep on hand. Better still, the peas cook in just minutes and often add a welcome spark of color. Even though I starting making homemade pie crusts when I was 16, as an adult, I lost the knack and for three or four years, struggled to make pie crusts worth eating. During this period, I often turned to Pillsbury's Refrigerated Pie Crusts and learned that to improve their taste by sprinkling the dough with a little sugar and rolling it out thinner. It's still easy to handle, you throw away the excess so save a few calories, and is less likely to get gummy during baking. I'm happy to report that once again I make pie crusts that cause people to moan with pleasure, see my recipe for Flaky Tender Pie Crust and step-by-step pie crust photos and tips in How to Make Flaky Tender Pie Crust. That said, I still keep a box of the Pillsbury crusts in the freezer, they do come in handy on occasion. Poblanos are my favorite "hot" pepper and are fast becoming a signature ingredient in my kitchen. Their dark-green skins are really quite mild, more "warm and smoky" than "fiery hot". In fact, the chef Rick Bayless calls poblano chiles "starter" peppers! An added benefit is that poblanos are often far less expensive than the pricey red bell peppers. Look for poblano peppers with the chiles, they'll be large and rather rumpled looking but are worth seeking out. Poppy seeds are priced like black pearls at supermarkets. Instead, buy bags of poppy seeds for a couple dollars at an international grocery. Canned pumpkin is a good choice for most baking, just be sure to purchase 100% pumpkin, not a pumpkin pie mix. But ever since discovering an easier technique for roasting a "pumpkin", I usually rely on Homemade Kabocha Squash "Pumpkin" Purée. You can also roast a whole butternut squash, a good substitute for pumpkin, even in 'pumpkin' recipes. In some parts of the world, 'pumpkin' is what Americans call winter squash. WHAT IS QUINOA? [pronounced KEEN-wa] Quinoa is a a high-protein grain and is considered a complete protein. It's also higher in unsaturated fats, lower in carbohydrates than other grains and entirely gluten-free. I love it because it's lighter-tasting than other grains and cooks quickly. Look for quinoa at Trader Joe's, Whole Foods and natural-food stores. Recently, I've begun to find "red quinoa" which has a dramatic appearance but tastes the same as "white quinoa". RISOTTO RICE For risotto, the traditional choices are Arborio rice and carnaroli rice. WHAT IS BROWN RICE? Because it is more healthful, whole and natural brown rice is nearly always my choice when cooking rice. But 'brown rice' is not a variety of rice. Instead it is any unmilled rice; the grains retain their outer hulls and their inner germs, keeping the nutrients intact. (The exception is "quick" brown rice, these should be avoided.) So look for all varieties of brown rice, basmati brown rice, jasmine brown rice, medium brown rice, long brown rice, etc. WILD RICE See also wild rice which is actually a grass, not a rice. TIRED of RICE? Try whole grains like barley, buckwheat, bulghur wheat, farro, kamut or quinoa or a whole-grain pilaf like Oven-Baked Whole-Grain Pilaf with Quinoa, Barley, Kamut & Other Grains. Rutabagas are also called "swedes", "Swedish turnips" – also "yellow turnips" for their lovely sunny color of their flesh – and some times, just "turnips". However, rutabagas are much different in appearance from the familiar purple-topped white-fleshed turnips (see turnip recipes) although can be cooked interchangeably. Rutabagas are large and dense root vegetables, usually sold covered with a layer of wax to preserve. It's easy to make your own Green Chile Sauce, aka Salsa Verde, but easy-to-find jars of salsa verde are inexpensive and great to have on hand. See also Green Chiles. Kitchen Parade typically calls for three or four types of salt. TABLE SALT is what most of us thought of as just 'salt' until we became cooks. It is fine-grained and includes additives to prevent clumping and to encourage pouring. It often includes iodine, a natural chemical that prevents goiters. (Did you know that with more people using non-iodized salt, the incidence of goiter is on the rise? Be sure to include iodized salt in your diet! I use it in the cooking water for vegetables, say.) It is useful for baking, since the small grains distribute easily throughout a dough or batter. For anything else, it can be harsh and bitter. To substitute table salt for a recipe specifying kosher salt or sea salt, use half as much table salt. KOSHER SALT comes in blue boxes (Morton Kosher Salt) and red and white cylinders (Diamond Kosher Salt). Look for them in the salt section at your supermarket. Either one will work, both are free of additives. I use both, interchangeably, but it's good to know (especially for brining and other salt-centric techniques) that Morton Salt is 'saltier' than Diamond because it's heavier; this means that 1 teaspoon of Morton Kosher Salt is the equivalent of 2 teaspoons of Diamond Kosher Salt. Kosher salt has a larger grain and is more gentle than table salt. It is less expensive than sea salt. To substitute kosher salt for a recipe specifying table salt, use twice as much kosher salt. SEA SALT, at least 'real' sea salt is more expensive than kosher salt, thanks to a time- and labor-intensive harvest, capturing the salt that's left when sea water evaporates. To substitute sea salt for table salt, use twice as much sea salt. FINISHING SALTS are typically sprinkled atop a dish (say slices of rare beef tenderloin or garden-ripe tomatoes) immediately before serving, adding bright bursts of saltiness and ironically, using less sodium. My favorite finishing salts are fleur de sel from France and Maldon sea salt from Great Britain. Sauerkraut is a busy cook's friend (it's already cooked), a dieter's friend (it has hardly any calories and tons of fiber), a frugal shopper's friend (it's cheap)! That's practically a miracle food. Do purchase sauerkraut in a jar or a plastic pouch, anything other than canned sauerkraut. Small butchers often have their own sauerkraut, it can be excellent. See also Cabbage. Sesame seeds were the first recorded seasoning, dating way back to 3000BC and Assyria. The tiny seeds grow widely in India and throughout the Orient and were brought to America by African slaves, who called the seeds benné (pronounced BEHN-nee) seed. No wonder that sesame seeds became popular in Southern cooking! Sesame seeds are most commonly ivory in color but also come in shades of brown, red and black. Sesame seeds have a nutty, slightly sweet flavor and are often used in baked goods such as breads, pastries, cakes and cookies – but most importantly in its ground form, akin to peanut butter. We call ground sesame seeds "tahini", it's one of two essential ingredients in hummus! Tahini is a thick paste the consistency of peanut butter made from ground sesame seeds. For the record, I don't recommend Trader Joe's Tahini "Sauce" product since it's not tahini. Since that product launched, Trader Joe's also sells small-ish jars of tahini, it's not bad but I prefer the imported bottles. Tahini should be stored in the refrigerator. Over time, it will separate, just run it through the food processor to reconstitute the tahini. WHAT IS SORGHUM? Sorghum (also called 'sorghum syrup' and 'sorghum molasses') is a plant-based sweetener that's popular in the American Midwest and American South. It has the consistency of rice syrup and is used like a table syrup on pancakes and biscuits. Do jars of jam mysteriously appear in your pantry? Here too! We love jam on our morning toast, nearly always Fried Bread made from my My Easy Everyday Bread Recipe. But after that? Think of jam as an ingredient, all of a sudden, it's handy to have on hand! To my taste, low-fat sour cream is a great lower-calorie substitute for sour cream but non-fat sour cream is largely to be avoided. Edamame is pronounced [eh-dah-MAH-meh], but in my family, we call them Aunt Edna May! Edamame are fresh soybeans and in the shells, they are my very favorite nutritious and kid-friendly quick snack. They're available shelled and unshelled in the frozen food section, also occasionally in fresh produce but much more expensive. Kitchen Parade recipes are "spice forward"  this means that spices are applied assertively to heighten flavor and increase satisfaction even when decreasing fat, sugar and portion size. Grocery stores are notorious for marking up spices to astronomical prices. Much better prices are found in international markets. But if that's not convenient, some bargains can be found, even at the grocery store. For the best prices for spices, check the spice aisle each trip, noting what's on sale. Just before Christmas, many baking spices go on sale for half price or less, this is a good time to refresh your spice cabinet. SPICE BLENDS  I rarely buy or use store-bought spice blends. Why? They're expensive. Many are heavy on salt, so hard-earned cash is spent on salt vs flavor. Many others are hard to find, so can't be replicated by Kitchen Parade readers so I don't want to rely on them. HOMEMADE SPICE BLENDS Two favorites are Spiced Tuscan Salt and Cajun Spice Mix. BAKING SPICE & CAKE SPICE  That said, for many years I have relied on two special spice blends from Penzeys, Cake Spice (cinnamon, star anise, nutmeg, allspice, ginger, cloves) and Baking Spice (cinnamon, anise, mace, cardamom). Use them 1:1 when cinnamon or nutmeg is called for in cakes, cookies, muffins, fruit crisps or anything, really. You'll notice the difference, things just taste a little bit better, there's some nuance and interest that just doesn't happen with a one-note spice. CINNAMON  I love another Penzeys product, the Vietnamese Extra-Fancy Cinnamon. PIMENTÓN [pe-men-TONE]  Pimentón is also called "Spanish paprika" or "smoked paprika" and is a mainstay in Spanish cuisine. It has a deep, smoky essence that has become a signature flavor in stews and braised meats, in eggs and grain salads. It's not inexpensive but is worth seeking out. I buy the semi-sweet pimentón but there is a "hot" Spanish paprika too. For online orders, check Penzeys and Amazon.com. St. Louisans, look for pimentón at Global Foods in Kirkwood. For recipe ideas, see Easy Baked Fish with Red Pepper & Cucumber Salad or Squash & Carrot Stew or search for pimentón in the Search Box. SUMAC is a ruddy red-colored spice. It's made from the ground fruit of sumac trees and shrubs and adds a wonderful sour note that I just love and is common in Middle Eastern food. Here, you can search for my recipes using sumac in the Search Box. Fresh baby spinach – including the oh-so-convenient bags of fresh baby spinach – is perfect for salads but too tender for cooking. For recipes where cooking is specified, choose the curly spinach often found in open bins. It will need to be washed very well and it often pays to cut out the tough ribs and stems. Kitchen Parade recipes use several kinds of sugar and other sweeteners. SUGAR If a recipe calls for sugar, assume granulated sugar, the standard refined sugar. American-style recipes are typically much sweeter than European-style recipes. My own taste skews to less sweetness so many Kitchen Parade recipes have been "Alanna-sized" with reductions in sugar, allowing the more natural, more healthful flavors of fruit or chocolate, say, to come forward. SUPERFINE SUGAR (CASTER SUGAR) creates a more tender crumb in some baked goods. It is a finer grain of sugar, what Europeans call 'caster' sugar. To make your own caster sugar, just run granulated sugar through a food processor. BROWN SUGAR is refined granulated sugar with molasses added back in. To measure it properly, pack the moist sugar into the measuring cup. If a recipe calls for brown sugar, either light brown sugar or dark brown sugar may be used, to my taste there is little difference. To make a cup of brown sugar, mix 1-3/4 cups powdered sugar with 1-1/2 teaspoons molasses. POWDERED SUGAR is also called 'confectioners sugar' and 'icing sugar'. A light dusting can add a 'finished' look to baked goods without adding much sweetness or many calories. VANILLA SUGAR builds the essence of vanilla, right into the sugar. In Europe, grocery stores sell vanilla sugar right alongside the other sugars. But it's so easy to make at home, I keep a jar among my baking ingredients. Just place "spent' vanilla beans (ones scraped clean) into a glass jar and leave indefinitely. DECORATING SUGARS are large grains of white sugar add visual and texture interest to the top of baked goods, again without much sweetness or many calories. Some times they are called "pearled" sugar or "Swedish pearl sugar". They can be hard to find but keep well in the pantry. Here's a source for a variety of pearl sugar on Amazon, once you get there, you might search on 'decorating sugars' too. RAW SUGAR is large grains of light-brown sugar are variously labeled "raw sugar" or "DEMERERA SUGAR" or "TURBINADO SUGAR". I especially like these for topping muffins, cakes, etc., for they add a bright burst of sweetness in the mouth, reducing the need for sugar in the baked good itself. Here's a source for a variety of raw sugar. SPLENDA I do bake with Splenda on occasion and have had quite good results substituting it for sugar, especially when the sugar's purpose is primarily sweetness. If a recipe has been tested with Splenda, that will be stated. CANE SUGAR is a new sugar for me, it is made directly from sugar cane. I purchase it from Whole Foods. "Summer Squash" is the general category of thin-skinned squashes that appear in the summer. The most common varieties are the familiar zucchini and yellow squash but pattypan squash and chayote squash are becoming easier to find during the growing season. ZUCCHINI NOODLES – SPIRALIZER "ZOODLES"
Sunflower seeds are an inexpensive and good substitute for walnuts, in pesto, say. Watch for a variety of sweet potato called Red Garnet, perhaps labeled as "yams" or "red-skinned yams" with a slightly sweeter and less mealy flesh. Ever been curious about the difference between sweet potatoes and yams? The tomatillo [tohm-ah-TEE-oh] is actually a fruit and like the tomato, belongs to the nightshade family. It resembles a small green tomato in size, shape and appearance. However, it also has a husk, a thin parchment-like covering which should be removed before eating or cooking. Vegetables 101: What Is a Tomatillo? WHAT IS TEPID WATER? ‘Tepid’ water is not a particular 'brand' or 'kind' of water, it is the term for water that is the perfect temperature for proofing yeast, not too hot, not too cold. I use the ‘baby bottle’ test, if the water feels warm to the inside of my wrist, it’s perfect. If it feels cold, the water’s too cold, if it feels hot, it’s too warm. For a funny story about tepid water, see my recipe for Acorn Squash with Quinoa & Dried Cherries. CORN TORTILLAS For better nutrition, choose corn tortillas rather than flour tortillas but watch especially for corn tortillas made with just a handful of ingredients and no preservatives. This likely means finding a source away from the typical grocery store, at least here in the Midwest. Here in St. Louis, I find El Milagro corn tortillas at Global Foods in Kirkwood but a Mexican or Latino grocery would work too. They're great! WHAT IS GOOD VINEGAR? Many Kitchen Parade ingredient lists are no more specific than "good vinegar" – which means, anything except harsh white vinegar. I buy red wine vinegar, white wine vinegar and rice vinegar from an international grocery, where the prices are lower than the supermarket. My very favorite vinegar is the sweet and gentle sherry vinegar. I am especially fond of the vinegars from O Olive Oil; they are pricey but during the first taste test, my then 15-year old nephew turned to me with surprise, "We could drink this!" We could indeed. Wild rice is a favorite in my home state of Minnesota. Much of the rice that's available in stores is raised commercially, it takes much longer to cook. The native wild rice, which isn't a rice at all but a grass, is difficult to find but a real treat. For a photo comparison of commercial wild rice and native wild rice, see my recipe for Wild Rice Salad. 'Winter Squash' is the general category of thick-skinned squashes that appear in the fall. Common varieties are the acorn squash, the butternut squash, the kabocha squash. WHAT KIND OF YEAST TO USE? I love to use cubes of fresh yeast but it is so very perishable that it's rarely found in the U.S. So like other bakers, I use dry yeast. There are two types of dry yeast, 'active dry' and 'rapid rise' or 'fast rise'. Rapid rise supposedly rises more quickly, supposedly sacrificing flavor for speed. However, I use the two interchangeably and notice no real difference. HOW MUCH YEAST IS IN a PACKET of YEAST? Commercial packets of yeast contain 2-1/4 teaspoons of dry yeast weighing 1/4 of an ounce or 7 grams. Over the years, I've learned to use a tablespoon of yeast whenever a packet is specified. Do check the yeast's expiration date. If it's past, you'll for sure want to 'proof the yeast'. HOW TO PROOF YEAST To 'proof yeast' means to ensure that its leavening properties are active. Just place the yeast in a small bowl with a tablespoon of tepid water and a sprinkle of sugar. If it bubbles in five minutes or so, the yeast is still alive and will be a good leavener for bread. If it doesn't, you'll want to get more yeast before continuing. WHERE TO BUY YEAST Whatever yeast you choose, for the best value, buy it in large bags at a warehouse store or even the grocery store. I gift half to a fellow bread-baker and keep my own in a jar in the refrigerator or the freezer where it will keep for months and months. YOGURT Grocery-store yogurts all taste the same to me, sweet and fruity, even the low-fat versions. Still I use plain yogurt, especially large tubs of non-fat yogurt, as a substitute for mayonnaise in potato salad, chicken salad, etc. GREEK YOGURT Many Kitchen Parade recipes call for "Greek yogurt", an especially thick and tangy yogurt that is some akin to sour cream. Cup for cup, Greek yogurt has more protein, fewer carbs and less lactose than sweet, gloppy American-style yogurts. Greek yogurt is beginning to appear in regular supermarkets (although with prohibitive price tags) but can be found in international markets and specialty markets like Whole Foods and Trader Joe's whose house-brand Greek yogurt is quite inexpensive. I'm especially fond of Fage Greek yogurt, especially the 0% fat. GREEK YOGURT SUBSTITUTE To create a decent substitute for commercial Greek Yogurt, strain whole or low-fat plain yogurt to remove much of the liquid. your link for colcannon points to beef stew instead. Thanks, Anonymous! The colcannon recipe is actually in the left column, to the left of the recipe for Emerald Isle Stew, both of which I heartily recommend!